Nicole's Homemade Treats: Mangia Monday! Faces, sculptured in sunken gloom, throng the streets in despairing and anxious haste. Being once again, habitually, shocked by the terror and cruelty of reality, as the clock starts its journey along the rails of another week of the same. Hello! I hope you had a wonderful weekend! As usual mine just FLEW by!! I am always amazed at all the activity that you can cram into two days - no wonder why I am always tired on Monday! Do you feel the same? Mondays are my day of rest, no major cleaning, simple meal, just doing the basics! In honor of my Mondays I have a easy-peasy recipe to share! Enjoy! 1.) Place tomatoes in bowl. 2.) Add lemon vinaigrette, shallots, & shrimp; toss gently. 3.) Allow mixture to sit at room temp 10 min for flavors to mix. 4.) Add avocado & season to taste with salt and pepper. 5.) Stir gently to combine. 6.) Portion lettuce on 4 serving plates. 7.) 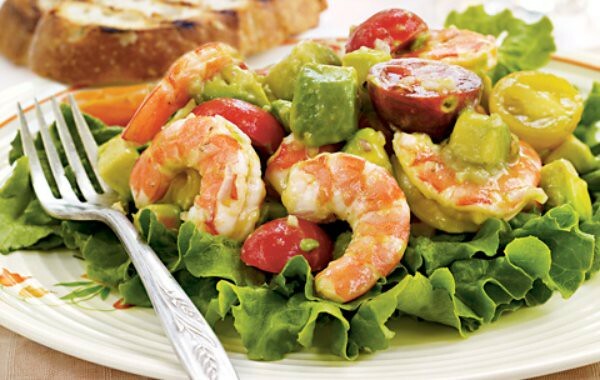 Top lettuce with shrimp salad. 8.) Serve with grilled Italian bread. 1.) Whisk all ingredients in bowl to blend. 2.) Season with salt and pepper. Oh Yum! I love shrimp!